You'll Want These EASY Instant Pot Shredded Chicken Tacos Every Week! Making Instant Pot shredded chicken tacos has become a weekly thing for us. 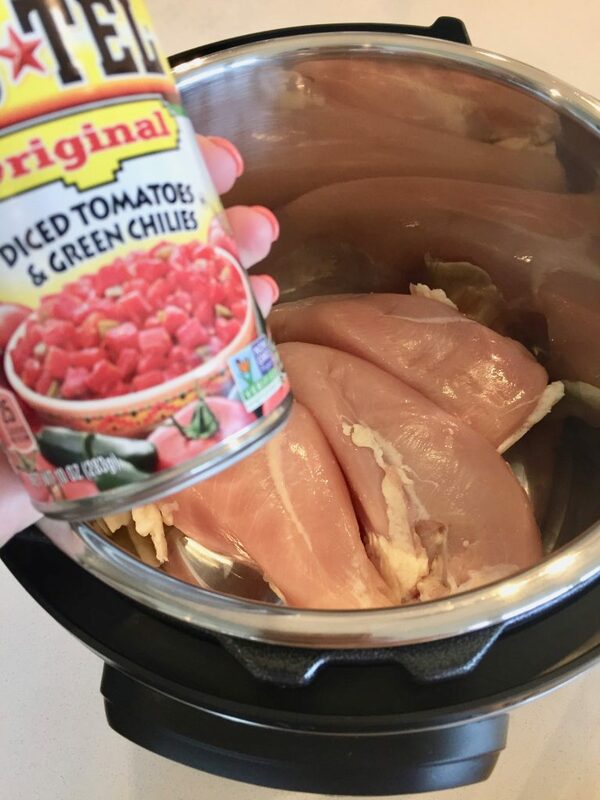 We LOVE shredded chicken tacos, chicken quesadillas and taco salads and they are SO easy when you use the Instant Pot to make the chicken. This recipe is not too spicy, not too sweet, just simply perfect for tacos and other Mexican food favorites. When we all jumped on the Instant Pot bandwagon they were selling out everywhere. At every turn they were “back in stock, sold out, back in stock and sold out again”. I suspect that the fear of missing out became the reason to get the Instant Pot, but I hear a ton of people saying that they never use theirs. Or, they used it once, and never used it again. Or, they’re looking for one and trying to justify the purchase (see the most popular version here). And, then there are the diehards that have thrown away every other small appliance that they owned and only use their Instant Pot. I’m not that Instant Pot crazy, but I’ll be honest I don’t use my Crock Pot as much as I used to. In fact, I’d guess that I’ve used my Instant Pot ten to one times on my Crock Pot over the last month. 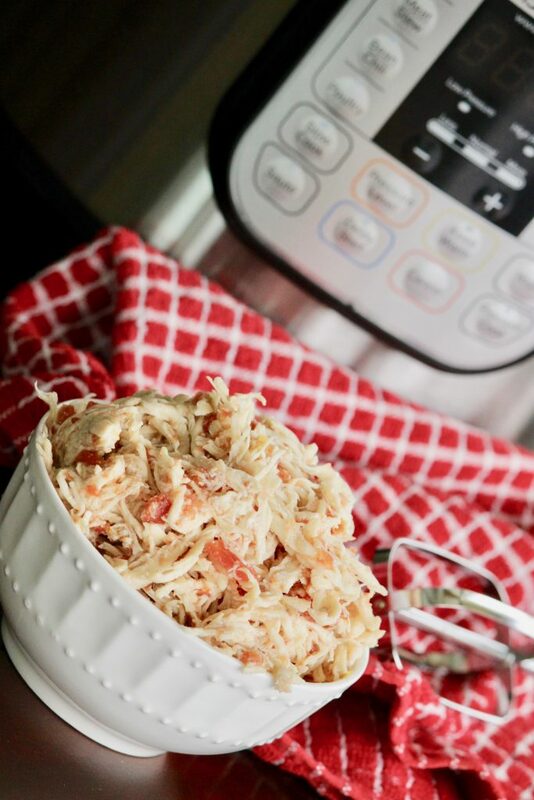 The biggest reason though, is this Instant Pot shredded chicken tacos recipe as it’s so versatile, along with my mashed potatoes Instant Pot recipe. We love hearty food around here, can you tell? I used to always, always make shredded chicken for tacos, shredded chicken for quesadillas, (all shredded chicken in fact) in my Crockpot. 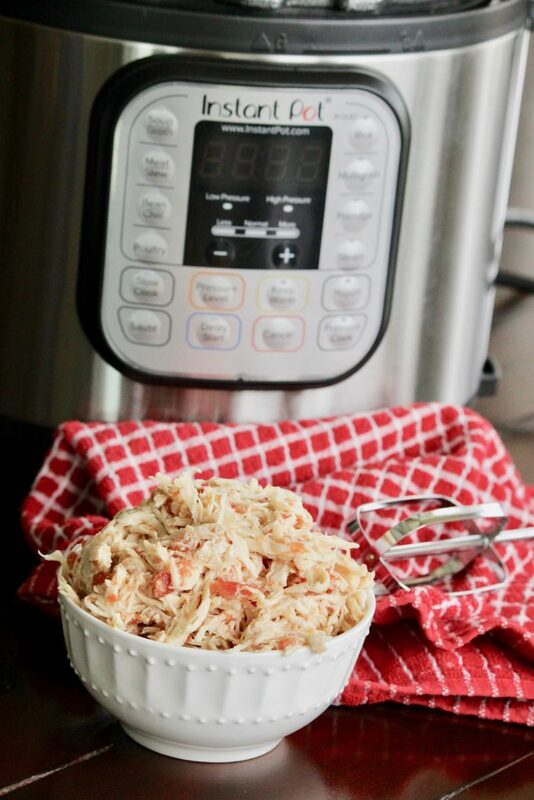 And, it’s still delicious, it’s just that making shredded chicken in the Instant Pot is so much easier. With 30 minutes including the time for cleanup, you’ve got enough meat for several easy dinners and simple lunch ideas ready to go. You just can’t beat it. And, my whole entire family loves these kinds of meals to. Oh, did I mention that this is only three ingredients? SO, yah, there’s that too. And, you can definitely make a bunch and freeze it for later, too. Can this shredded chicken for tacos be used other things, like quesadillas? I use this chicken for everything Mexican! You can use this to make hard shell tacos, soft shell tacos, tostadas, add the Mexican shredded chicken to queso blanco, taco salads, enchiladas, or, quesadillas. And, of course, there’s always chicken nachos. 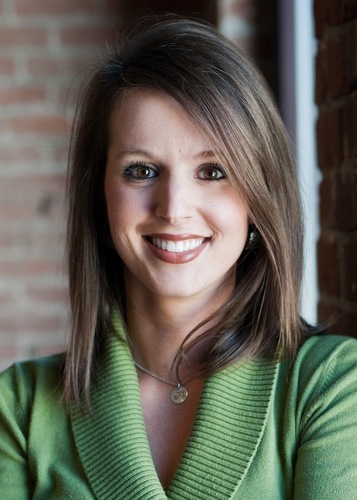 It is a great alternative to the regular ground beef taco meat that we’re accustomed to. 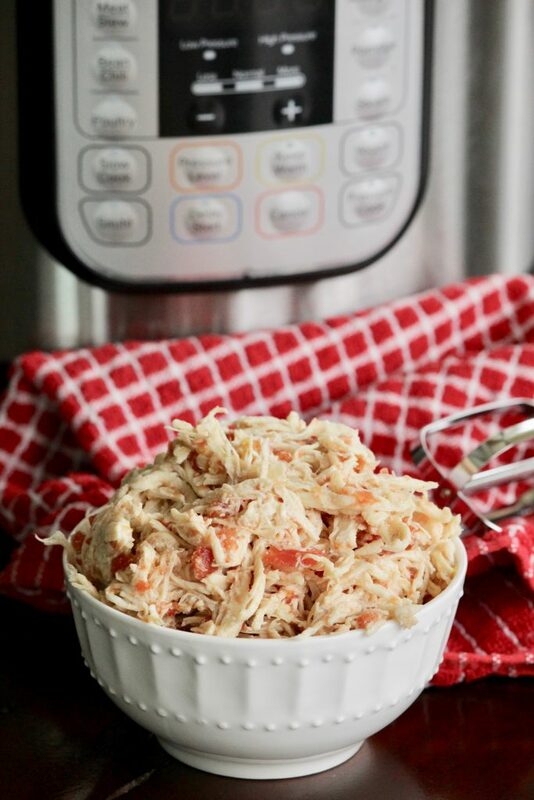 Is Instant Pot shredded chicken the fastest method? 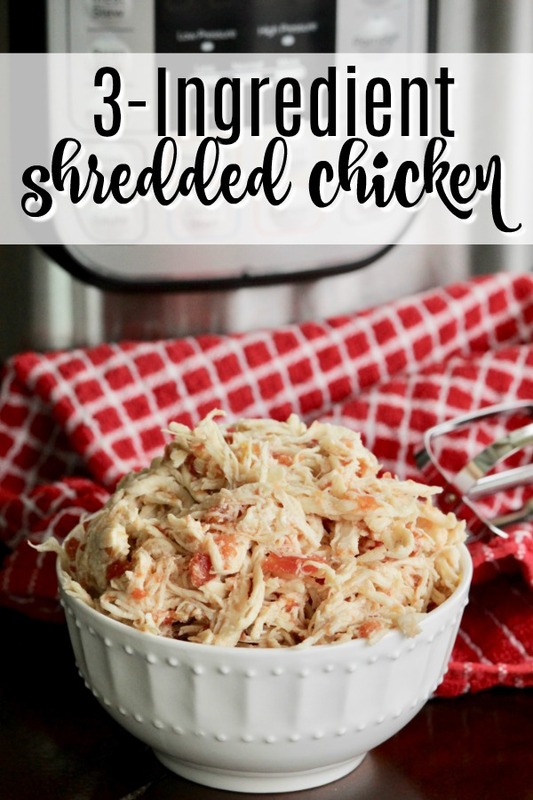 Making shredded chicken in the Instant Pot is 100% the fastest way to make shredded chicken for tacos, or shredded chicken for enchiladas for example. When I used to use the Crock Pot for chicken taco meat it would take our to six hours depending on how much I was making. 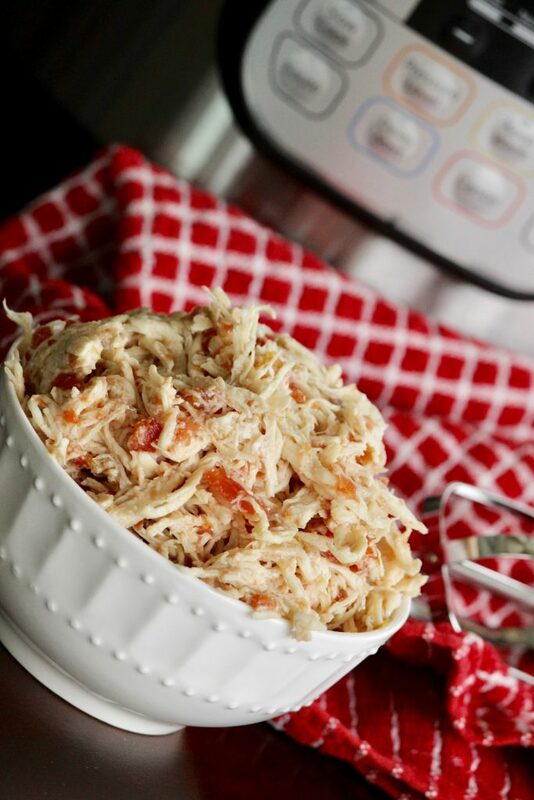 So, to be able to cook four to eight cups of shredded chicken in under an hour in and out, all cleaned up … simply ah-mazing! Can you use chicken thighs instead of chicken breast? You sure can! And, when you make shredded chicken with chicken thighs instead of chicken breast, you’ll end up spending quite a bit less money as well. Use the same cooking times as you would if you were using chicken breasts if you decide to use chicken thighs. You’ll want to first gather your ingredients. Chicken, chicken broth and Rotel are all you’re going to need for the most delicious meat for chicken tacos and other Mexican dinner ideas you’ve ever had. In your Instant Pot layer the chicken broth, the chicken breasts (or thighs) and pour on the Rotel. Spread the Rotel out a little bit, but not so much that it’s all around the sides of the Instant Pot. Seal the Instant Pot lid, set the valve to sealed and press the “pressure cook” button and set to high pressure for 12 minutes. You can do a quick release by flipping the valve to venting (be very careful of the steam! ), or feel free to let the chicken do a natural release. Your chicken will be delightful either way. The natural release is what I’ve used, because I like the chicken to be really soft and tender. There will be a lot of juices in the pot when you remove the lid. I leave the juices, but if you want a less runnier chicken, pour some out. I find that when I leave the juice, the chicken ends up soaking up the juices as it sits. 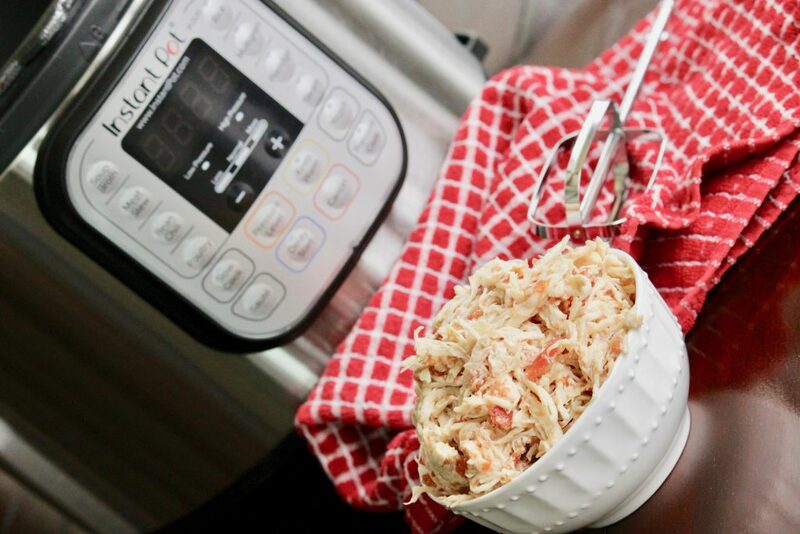 That works for us, but if you want a drier shredded chicken, drain some of the juice out. You just can’t go wrong either way. 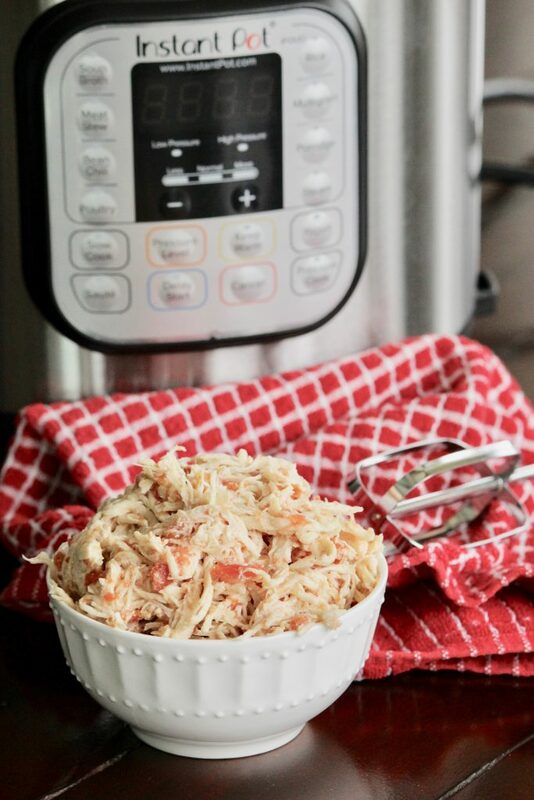 Once the lid is off the Instant Pot, grab your hand mixer (this one is on my wish list! ), pull the metal pot out of the Instant Pot device and use your hand mixer to shred the chicken. It will be so much faster than using two forks and because the Instant Pot is deep, but thankfully deep enough to not let chicken fly everywhere either. 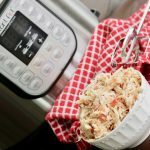 Making Instant Pot shredded chicken tacos recipe is not too spicy, not too sweet, just simply perfect for tacos and other Mexican food favorites. Use this meat for shredded chicken tacos, chicken quesadillas, chicken nachos, taco salads and more! Serve with tortillas, shredded lettuce, shredded cheese, salsa and all the fixins'!